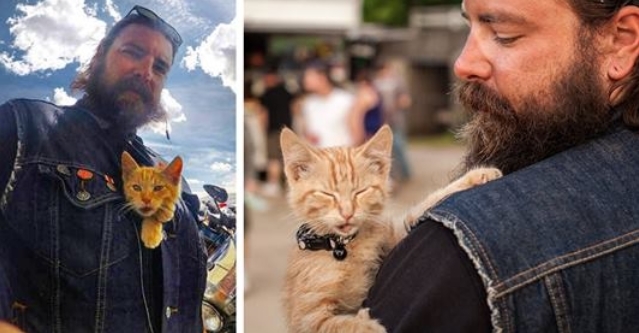 A motorcyclist found a tiny injured kitten that needed a lot of help at a truck stop, he decided to help the little guy, tuck him in his vest and continue on his cross country trip while taking care of the kitten. Pat Doody has been riding cross-country (from Nevada to New Jersey) with a little kitty snuggled up to him since he rescued him. 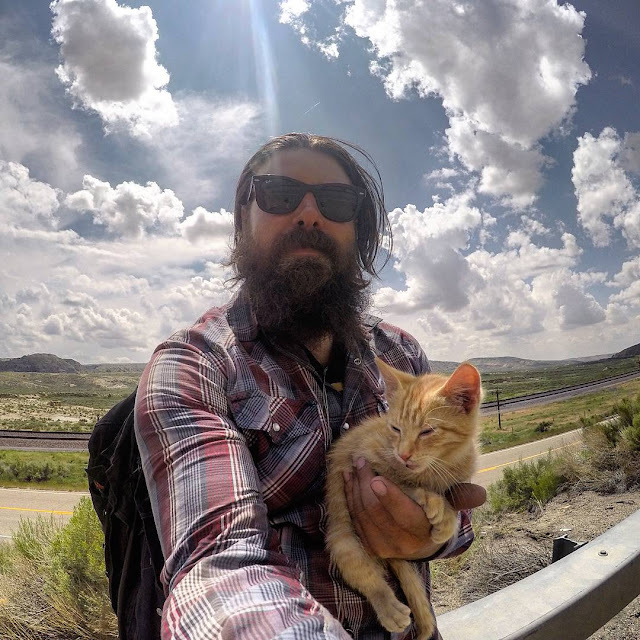 His furry sidekick has quite an unbelievable story.While he was in Nevada at a truck stop getting gas, he found the kitten who was crying for help. 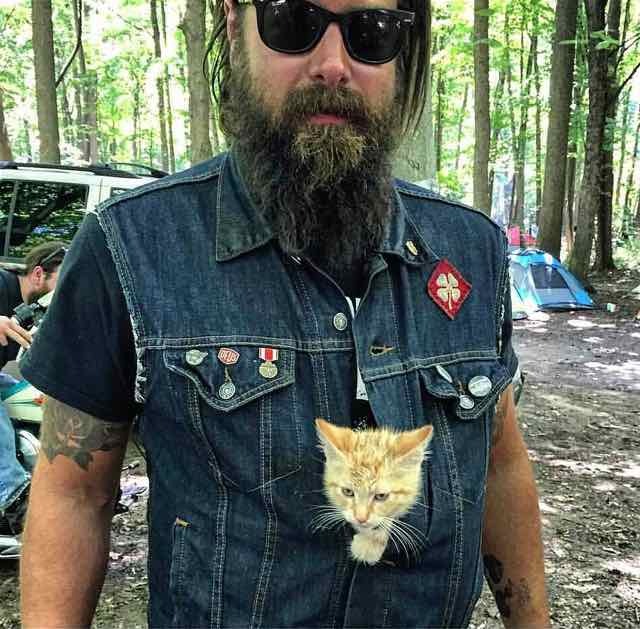 “He was pretty badly burned, so I picked him up and tucked him inside my vest. 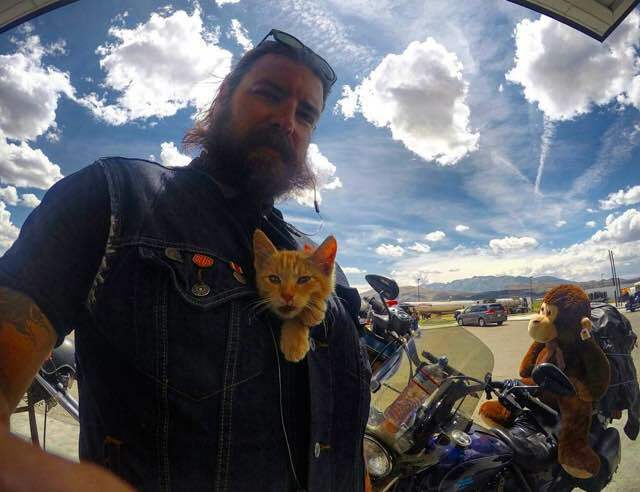 We’re feeding him regularly now, so he’s doing better, even though he’s sort of living on the road until we get home,” he told Revzilla. “His burns are pretty much all healed up except for the little spot on his lip… We’ve been keeping it clean and using neosporin. It looks a lot better and doesn’t seem to be bothering him. He’s so chill. 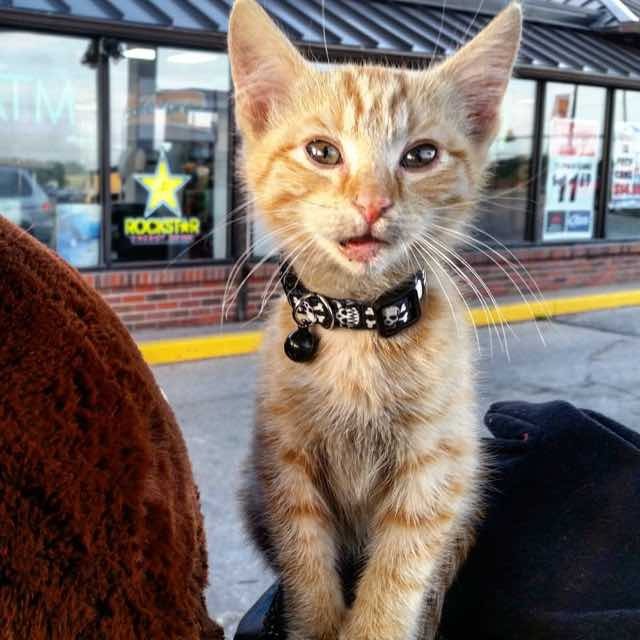 He just hangs out in my vest when we get on the road. 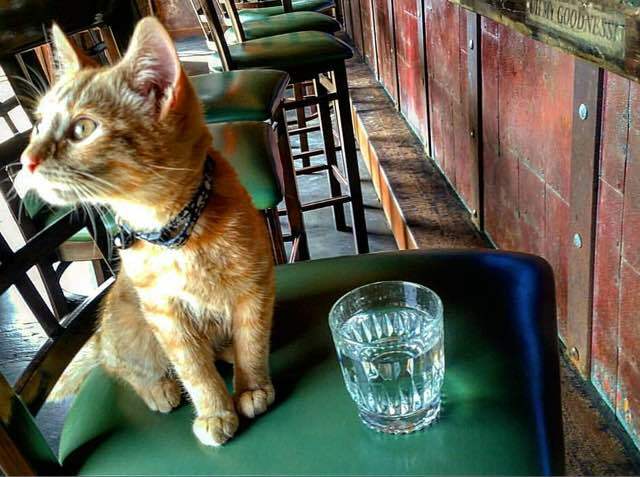 I’ve never met a cat so calm.” They named the little buddy Party Cat. 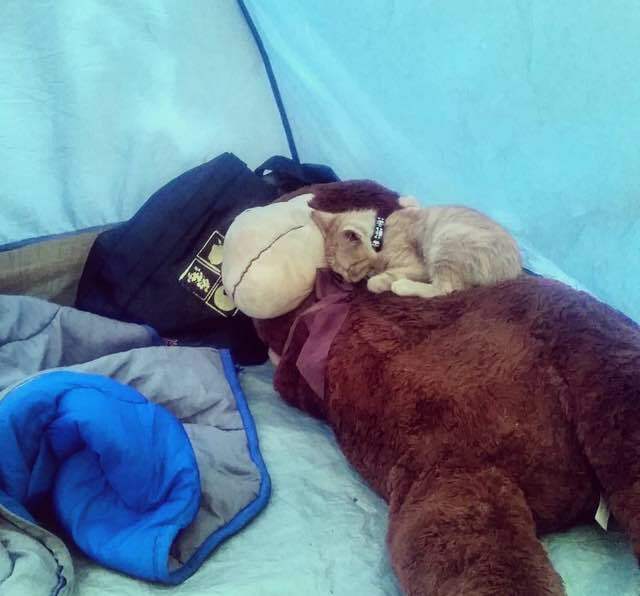 After a long day of playing, Party Cat is all tuckered out on his monkey that they bought on the road. 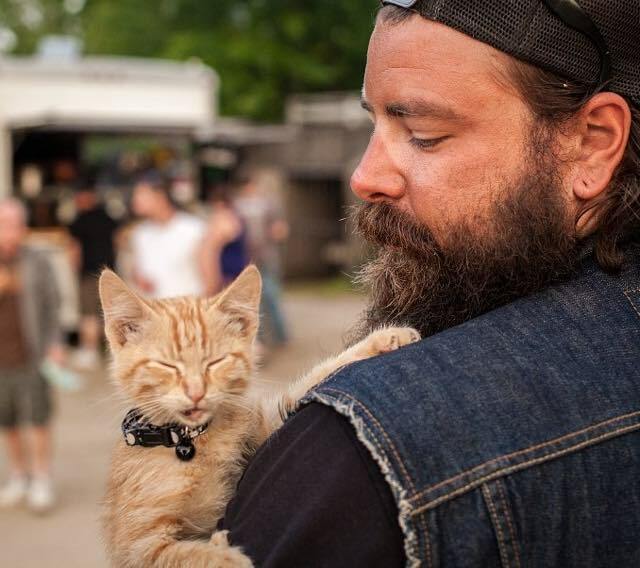 Responses to "Biker Saves Injured Kitten and Continues His Trip While Caring for Him"
Thank you for rescuing the tiny injured kitten. Compassion is God's gift to the soul. God Bless you for caring for this kitten I'm sure you have made a lifelong friend even though you were traveling you stepped up to the plate. You ROCK!!! Your kitty is adorable and your heart and soul is as well. Many happy miles to you both. Thank you for the awesome pics. You are a special person with a beautiful little buddy. Thank you!!! Your Compassion / time / love for this little injured kitten. Love the name "party cat".!! I hope you continue your journey together and keep him for the rest of his lucky life. It was meant to be to cross paths. Thank you again. May your soul be all the more brighter for your love and compassion for your new side kick, Party Cat...you rock! Yay! Such a great story! Now that's my kinda man! Thanks for being so kind - it makes the world a better place. Proud to hear of another amazing biker breaking the misplaced stereotype. You're a good man, and I hope you and Little Party Buddy Cat live a long happy life together. Gracias por rescatar al gatito. Será tu eterno acompañante. Se vé el gran corazón que tienes. Dios los acompañe en el viaje y en su regreso a casa. Te reconozco por tu ayuda y compasión por los animales. Muy orgullosa de tí. Gracias, gracias. You have a big heart. Thank you for not turning your back. Gotta love them bikers!!! You both were there for a reason at that moment!!! Bring him to a vet, and he needs rich food for skinny poorly nurrished kittens. And milk for cats. Thank you for your good heart. Take good care of him, he needs food and treatment for his injury + vaccines. He will reward your good soul 10 times with grace and tons of purrrrrrs. :-) Live long and safe, both of you ! More people like you in the word can make a better place. Thank you for your kindness AND safe journey for all of you. So good to hear that there are some kind loving young men out there. Thank you so much for saving this kitten, will you keep it? Once again proving that bikers are some of the most kind-hearted people in the world! Thank you Pat for taking Party Cat! Ride on little dude. I would vote for a man like you for president any day over that shithead Trump. Looks like this cat picked himself a good human. Such a kind heart. Looks like kitty found himself a good home. 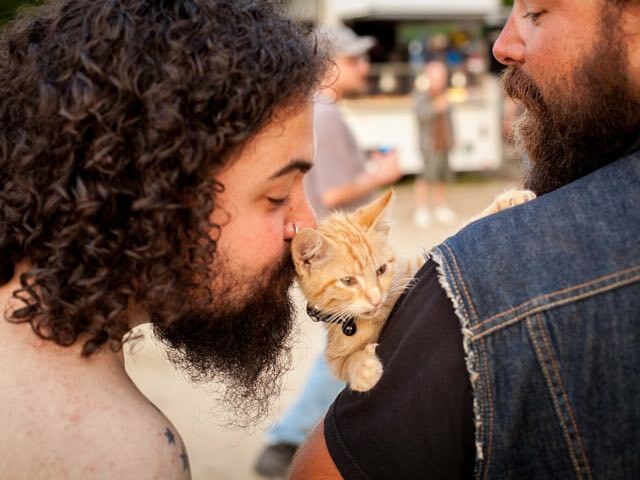 Real men love cats. You are awesome. Good luck to you and your cat. You are a kind person. What a beautiful spirit you have. Thank you for sharing the photos and story. God Bless your kind heart and soul! You sir, deserve a medal. I believe you have yourself a new buddy. Cheers to you! 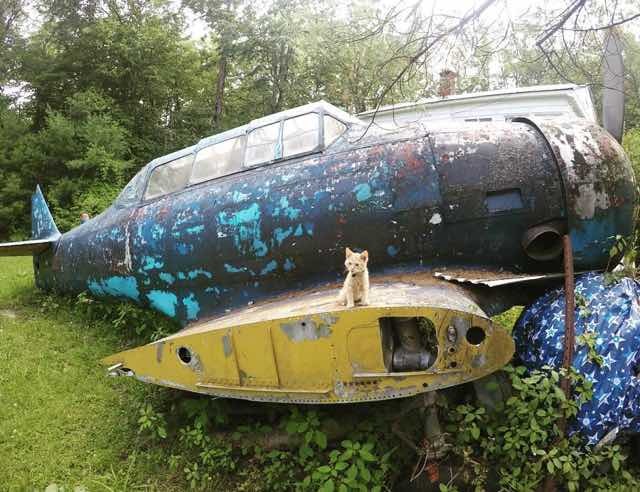 No doubt the feline, now "Party Cat", had crawled up inside a cars engine compartment to hide or for warmth when engine was not real hot. No telling how far it rode in there until the driver stopped long enough (for fuel, latrine, snacks, etc.) for it to escape it's hot and noisy prison. I found a small grey cat under the hood of my cage once, after a 120 mile trip to a rally. Named it "Rumble" as it's purr (once removed from beside the engine) was a deep rumbling sound ! Had that critter for 11 years before some Jack-wad poisoned it! Great rescue job Brother ! Ride on Party Cat ! You rock! Party Cat is lucky you came along. Ride on Party Cat! what a wonderful person you are. Lucky little cat! I'm a lady biker and like you I would care fir any animal that's injured.You have a lovely Spiritual soul and it's so lovely to read your story. Just more proof that some of the best people out there to have your back is a biker. Stay safe while on the road and may it always rise up gently to meet you while on your journey. God bless you. We need a million more people like you. And praying for the little ones burns to heal quickly :)! You are an amazing man/human being! This restores my faith in humanity. Thank you for being you! If someone doesn't believe in miracles then they are blind. 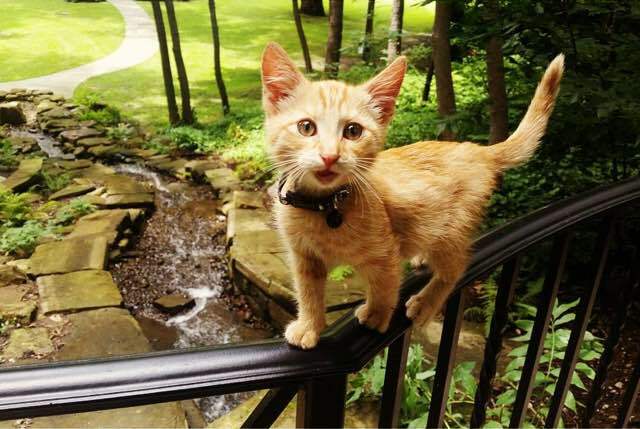 The miracle is that Party Cat was badly injured and managed to find his "earth angel" in you. You didn't just care for him, you opened your heart and gave him a renewed life filled with love. Thank you for reminding us that there are truly good people in this world today. Godspeed and safe journeys. Thank you. Sometimes our best friends are those whom we rescue from circumstances that would kill others. Yet our new friends thrive because all we show them is a little compassion. You're definitely a righteous brother! You're a perfect example of a kind human being loving and caring for an animal in distress. You Sir did not turn your back and walk away like many I'm sure have. You decided you would do something. This sets you apart from so many. God bles.